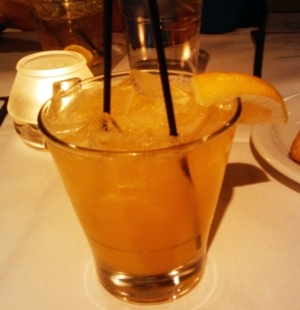 The mirwinator is made of Evan Williams brandy, thyme, orange juice, and lemon juice. Except for the thyme, that’s a pretty standard list of ingredients, and there’s a reason for it. The combination of those flavors always makes for a first-rate cocktail, and the mirwinator is no exception to that rule. Yet it seems somehow too easy, both to drink and to mix, for a $9 drink. Perhaps if the quantity of thyme had been kicked up a few notches, then it would have been sublime.